I took a refresher class in Blackletter with Renate Worthington yesterday - she's such a great teacher. Love her lettering. So figured what better than to practice and make a card... Then I found this quote that was just perfect for my mood today... It hasn't stopped snowing since this morning and we've accumulated a few inches here in Calgary, the first of the season, so can't really complain. You can see more details and descriptions by clicking on card image. Enjoy. Beautiful embbossing and pretty creation Yogi. Thank you for playing along with us at DigiStamps4Joy and we hope to see you again. this is elegant and gorgeous card. Wow, your snowflakes are so beautiful. It must have taken you ages to make those. Thank you for joining in with our Black and White challenge at Cuttlebug Mania. 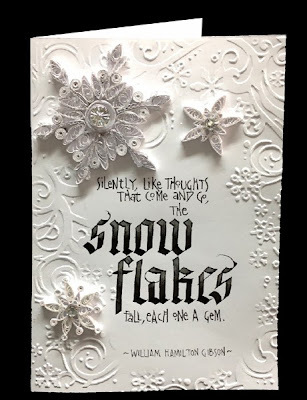 sooo beautiful and elegant..your snowflakes and lettering...wow! Thank you so much for joining us on Premium crafts challenge. This card is absolutely stunning!! I love white cards, they are so elegant; and the lettering is beautiful. WOW! !